Last week we had some dear friends over for dinner. We split up the dinner responsibilities and decided that ice cream would be the perfect choice for dessert. I decided to make two different kinds of ice cream and this was one of them. 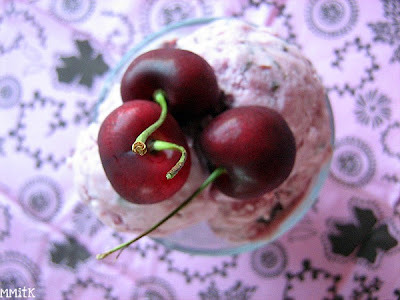 I have been holding onto this recipe since last fall because you can't make cherry ice cream without fresh cherries. Summer was the only logical time for me to make this ice cream. This is a no-custard needed ice cream, so it is fairly easy to mix up. Eh.... YUM!!!! 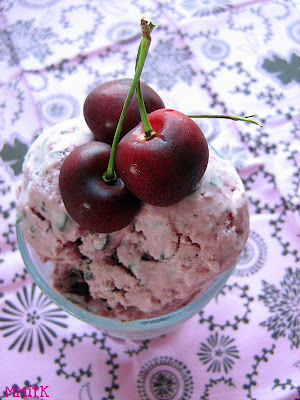 Need to get me some cherries!!! !